At present, Hong Kong is one of only three locations outside of the U.S. where the ARE 5.0 exams are offered. 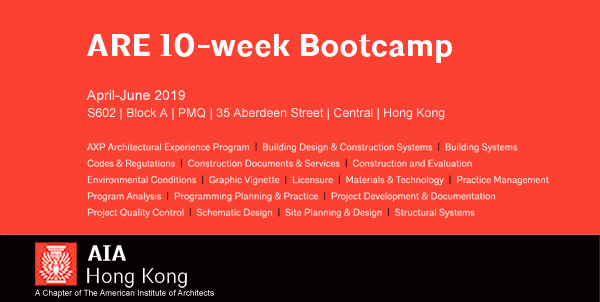 To assist our young members in the licensure process AIA Hong Kong is starting a peer-to-peer ARE Bootcamp that will meet weekly, via conference call, to help keep you accountable and motivated. Becoming a licensed architect requires a lot of time and commitment, so by meeting weekly you will be able to help, and learn from each other – and keep to a schedule. Please sign up at emergingprofessionals@aiahk.org. Be sure to include your full name, affiliation, and email address. Seats are limited to AIA members only.